While there are a lot of choices for consumers, the current state of music on the Internet leaves a lot to be desired. Earlier this spring, five other parents and I formed a garage band called the MCats to perform at a fund raising event for our local elementary school. About the only thing harder than trying to schedule rehearsals was trying to purchase legal copies of all of the songs we wanted to play. Even when we were all able to find the same songs, they weren’t always recorded in the same key. It’s a good thing I have access to a transposing keyboard, because I often had to change keys during our rehearsals. While there are a lot of choices for consumers, the current state of music on the Internet leaves a lot to be desired. In a previous column (11/2004), I wrote that I would like to purchase MP3s of all of the albums rated five stars by Rolling Stone magazine. Come to think of it, I would also like to purchase the CDs. But Rolling Stone magazine makes its five-star rated albums nearly impossible to find, much less purchase. Information about an album’s original recording date is typically not available. What key is the song in? Who wrote it? When? If you wanted to find all of the songs that were hits when you were in college, preview them, and buy them, where would you go? Why is the music we want, in the formats we want, so difficult to find on the Internet today? As you’ve no doubt heard by now, in June 2005, the United States Supreme Court handed down its decision in the MGM v. Grokster file-sharing case. 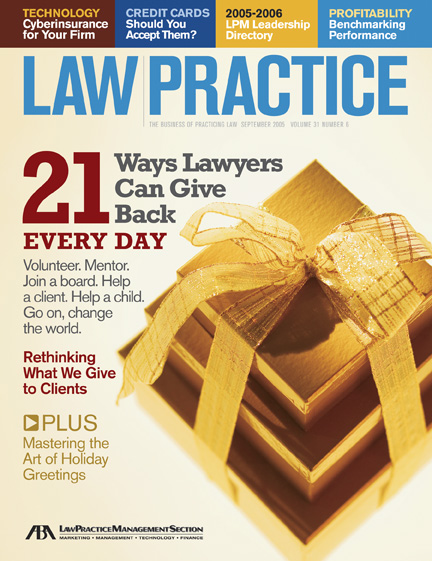 The recording industry won, because the court held that P2P software makers can be liable for copyright violations by the users of P2P software. The P2P industry won, because the Sony doctrine was not overturned. But the public lost, because the court raised more questions than it answered. Denying cert. would have been better than issuing this opinion. The court artificially and unnecessarily framed the case as one of the “competing” values of artistic protection and technological innovation, and then, having done so, handed down a decision that does not define a clear black-and-white rule about how to balance these values (assuming that such balancing is necessary). What is the limit of the new inducement theory of copyright liability? The court couldn’t even decide, handing down its main decision along with two concurring decisions. What we are left with is more gray, more uncertainty, in an area of the law in desperate need of clarification. I firmly believe that because the music industry’s offerings on the Internet today are so woefully incomplete, many Internet users have resorted to P2P networks to find the music they are looking for. And I believe that P2P litigation is a symptom of a larger problem, namely that the music industry is broken. In my office, radio reception is nonexistent, so if I want to have music in my office, I can either bring in a CD or MP3 collection or I can listen to a radio station streaming its audio over the Internet. If you have 100 CDs, each containing an hour of music, your collection would last all of two weeks. Personally, I prefer more variety. Although I understand why many people choose to download music from P2P networks, I choose not to do so. So I ruled out the CD/MP3 option pretty quickly. Fortunately, my favorite local independent radio station streams over the Internet, but this is the exception, not the rule. 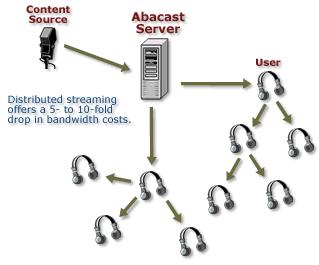 The station streams its audio in Windows Media format and uses the Abacast service (which also supports MPEG Layer 3 (MP3) and aacPlus formats), which turns each listening client into a server so that one centralized server doesn’t have to bear all of the load of serving audio (http://www.abacast.com/company/technology.php). 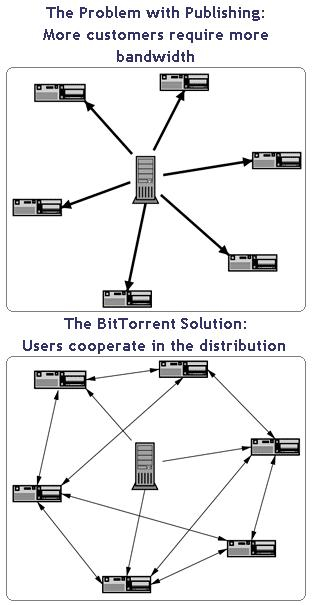 In this way (and somewhat ironically), Abacast works similarly to the Bittorrent (http://www.bittorrent.com/introduction.html ) P2P application. First, check your favorite radio station’s website to see if they are streaming their content. Chances are they are not. Second, check the website of various technology providers, such as streaming service provider Abacast (http://www.abacast.com/radio.php ), or MP3 streaming service provider Shoutcast (http://www.shoutcast.com/) (an AOL company). Third, try one of the directories of radio stations on the Internet such as Triple A Radio (http://www.triplearadio.com/the_panel/) or Radio-Locator (http://www.radio-locator.com/) (formerly the MIT List of Radio Stations on the Internet). Apple’s iTunes (Mac OS and Windows) (http://www.apple.com/itunes/). Media Player Classic (Windows only) (http://sourceforge.net/projects/guliverkli/), a GPL-licensed replacement for Window Media Player. Musicmatch Jukebox (Windows only) (http://www.musicmatch.com/). VLC Media Player (Linux, Mac OS, Windows) (http://www.videolan.org/). Windows Media Player 10 (Windows) (http://www.microsoft.com/windows/windowsmedia/). Windows Media Player 9 (Mac OS) (http://www.microsoft.com/mac/otherproducts/otherproducts.aspx?pid=windowsmedia ). I use Media Player Classic to listen to my favorite radio station directly (bypassing the Abacast service). When I can’t connect to that station, I use iTunes to listen to other radio stations. So far, I have not needed a third option. I also use the lowest quality bitrate (typically 32 Kbps), because I don’t want to waste my incoming bandwidth on high quality audio that my cheap computer speakers can’t reproduce (which may also explain why many P2P users don’t care about the typically low quality of the MP3 files they are swapping). In some cases, it is difficult to separate a music service provider from the media player it prefers, but don’t assume that you have no choice. You can use iTunes to play some audio streams that are not listed in the iTunes Radio directory, and you can play many audio formats with VLC Media Player. Apple’s iTunes service (http://www.apple.com/itunes/) uses the iTunes player (Mac OS , Windows), includes over 1.5 million songs (in the AAC (.m4a) format), streams audio from over 1000 radio stations, and supports podcasting. Podcasts are radio-style audio content that is recorded, not streamed, so you can download podcasts and listen to them whenever you want. MSN Music (http://music.msn.com/) uses the Windows Media Player and includes over 1.0 million songs (in the Windows Media format). Separately, MSN Radio (http://radio.msn.com/) streams audio from over 3000 stations. Yahoo Music (http://music.yahoo.com/) uses the Yahoo Music Engine (http://music.yahoo.com/musicengine/) (Windows only), includes over 1.0 million songs (in the Windows Media (.wma) format), and streams audio from over 120 radio stations. Yahoo Music Engine appears to be based on MusicMatch Jukebox, which Yahoo acquired. A music rental service, Yahoo Music Unlimited, is also available. Yahoo Music Unlimited and MusicNet@AOL both use content from MusicNet (http://www.musicnet.com/). RealPlayer Music Store uses Real Player (http://www.real.com/) (Windows, Mac OS), includes over 1.0 million songs (in the RealAudio (.rax) format), and streams audio from over 100 radio stations. Confusingly, Real also has a music rental service called Rhapsody (http://www.rhapsody.com/) (Windows only) (http://reclisten.custhelp.com/cgi-bin/reclisten.cfg/php/enduser/std_adp.php?p_faqid=388 ). Napster (http://www.napster.com/) (Windows only) is a music rental service that includes over 1.0 million songs (in the Windows Media (.wma) format). Sony Connect (http://www.connect.com/) (Windows IE only) uses the Connect Player (Windows only) and includes about 800,000 songs (in the ATRAC format) from the Sony music catalog. Can you name ten songs from the Sony catalog? Do you know which label your favorite artist is signed to? eMusic (http://www.emusic.com/) is a music subscription service with over 600,000 songs in the popular MP3 format. MP3Tunes (http://www.mp3tunes.com/) includes over 300,000 songs (in higher quality 192 Kbps VBR (Variable Bit Rate) MP3 format) from mostly independent artists. Mindawn (http://www.mindawn.com/) uses the Mindawn Player (Windows, Mac OS, Linux). Unlike most other music services, Minder offers songs in both “lossy” (Ogg Vorbis) and lossless (FLAC) formats. During our band’s latest performance, my son Ben joined us, playing keyboards for one song. It is his keyboard, after all, that I have been borrowing for the band. And it is for the benefit of the kids (and their school) that the band was formed in the first place. So Ben rocks, even if the music industry currently doesn’t. Hopefully by the time my kids are in college (and/or in bands), finding legal music online will be much easier. Until then, I created a web page that lists all of the 148 albums rated five start by Rolling Stone magazine (http://www.giantpeople.com/474.html). You know, for the kids!